Made from the branches of 5 beautiful Carmarthen trees are my walking sticks. Each has its own decoration and meaning, which when finished will be released on my favourite South Wales mountain walks. Hopefully the walking sticks will go far! 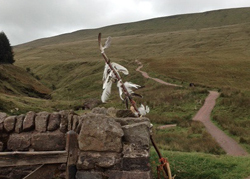 20.9.15 - Today is my birthday and I left The Rhythm Stick on Pen-Y-Fan. I walked all day with it and the stones tied on to it make a hypnotic beat to keep you going. Email elin@elinlloyd.com or Facebook message me. I'll put the photos and stories up and make a proper website and log for their journeys.